Will Twitter’s new character limit give the platform the freedom to spread its wings or be a spanner in the works for the company? As the world completes another spin on its axis and people make plans on how this year will be ‘different’, so too does social media look forward to another year of changes. Last week Twitter CEO Jack Dorsey made a statement that strongly suggested that massive changes to the social media platform were on the way. This followed a Re/Code Report that alluded to Twitter upping its 140 character limit substantially to 10,000. Twitter has used the 140 character limit since its inception and many are worried that without the limit Twitter will lose some of it’s character and charm. Others claim that the change will allow Twitter users and businesses more freedom with posts and room for information. Others also point to Facebook and Twitter’s tendency to mirror successful features of their competitors (likes, hashtags, autoplay videos) in their own websites and point to the increased character limit as an expected extension of this. We at Sleeping Giant Media see the merits on both side. Sometimes you only need 140 characters to say how great a sandwich is, whereas other times, like when explaining the plot of popular thrillers, the same limit makes them lose some of their magic. 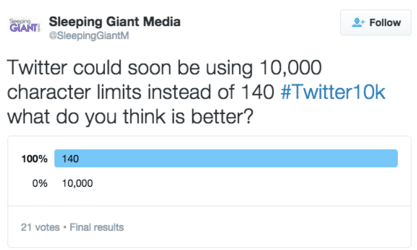 We did a poll on Twitter to see what our followers thought of the change. It was fairly one sided. We also asked people for their opinions of why the alleged change would be a negative one. @itsKrisJB said that it would be a bad idea, as the low character format was what made the platform “unique” and made it easy to “scan and receive tonnes of data in seconds”. @Kentfoundation suggested that it might be an interesting idea to cap the amount of 10k posts per week, meaning that users would have to consider and utilise the function, rather than take it for granted. It is clear that the notion has already generated a tonne of mixed publicity, and it would be interesting to see how this changes if Twitter decide to go ahead with their plans. With so many platforms for communication, staying flexible and unique is an important necessity. Stay the same and face being pushed aside by another company who offer something you don’t, or change too much and risk alienating your core user base. It is a tricky path to tread. Social media is a constantly changing world and one where the smallest changes can be received in various ways. One of Facebook’s strengths is its ease of use, and it will be interesting to see whether Twitter’s liberal nature to the character limit welcomes in a new wave of business and users previously put off by the limit, or if it will diminish the unique nature of Tweets and their required charm and creativity. We for one are excited to see the new changes in the ever expanding, shifting, exciting digital universe. After all, new year, new social you.